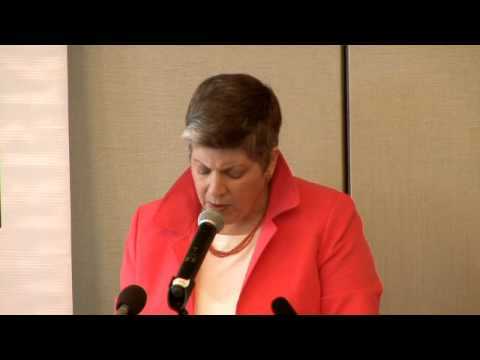 Janet Napolitano was sworn in as U.S. Secretary of Homeland Security in January 2009. Prior to becoming Secretary, Napolitano was in her second term as Governor of Arizona and was recognized as a national leader on homeland security, border security and immigration. She was the first woman to chair the National Governors Association and the first female Attorney General of Arizona. During her term as governor, Napolitano was named one of the top-five governors in the country by Time Magazine. Janet Napolitano is the third and current Secretary of the Department of Homeland Security, and the first woman to serve in that office. Janet Napolitano was born in New York City and grew up in Pittsburgh, Penn., and Albuquerque, N.M. She graduated from Santa Clara University, where she won a Truman Scholarship and was the university's first female valedictorian. She received her Juris Doctor from the University of Virginia School Of Law.